On April 30th 2013 in Amsterdam, King Willem-Alexander has succeeded his mother Queen Beatrix of Oranje-Nassau as King of The Netherlands. Beatrix served in this position for 33 years. 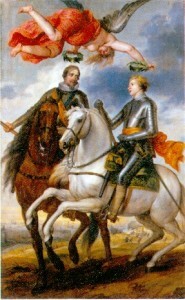 The dynasty of Oranje-Nassau started with Willem van Oranje, father of Maurits and Frederik Hendrik, the riders on this painting. It is part of the decorations in the Hall of Orange in the royal residence in The Hague. The two brothers established the independancy of The Netherlands from Spain, which was concluded by the peace treaty of Munster in 1648, just after the death of Frederik Hendrik. We see the two brothers on their horses, which were indispensable for their military victories. From the sky Victory provides them each with a laurel wreath. The elder brother Maurits looks with affection at his younger brother Frederik Hendrik. Their horses show the same attitude towards each other as their riders do. They are close to each other and full of confidence. The artist has made clear the perfect attunement of the riders to their horses and to each other. The grey horse of Frederik Hendrik performs the levade, while the bay one with Maurits trots and comes to a halt. The artist has clearly wanted to emphasize the common goal of the brothers in the service of the country. The style of this commemoration is very different from the style of the present constitutional monarchy, but it is useful to acknowledge its historical roots.